Escaping from thatched roof chocolate-box cottages, Johan Smits tries out the unassuming ski slopes of Shymbulak and ice rink of Medeu in Kazakhstan. The view from the 2,840-metre ski mid-station is breathtaking – and so is the prospect of having to slide down the steep slopes. Have I been overconfident taking the chairlift all the way up here on our first skiing day? Moreover, the sight of people clad in helmets, goggles and protective padding – all of which I lack – fills me with regret being old school – or rather no school at all. But what goes up must go down. Three days ago we arrived from Dushanbe on a long weekend trip to Almaty, Kazakhstan’s former capital, and, after having explored this vibrant city I convinced my wife to try out ice skating for the first time in her life – at Medeu, the world’s highest Olympic-sized skating rink. There’s no better way to soak up the weekend vibe and camaraderie than on a packed, public bus cheek by jowl with young and old, lugging along skates, snowboards and skis. A taxi ride would have been more comfortable but the twenty-minute bus journey up the winding mountain road catapulted us straight into the right mood. Our go at winter sports activities was a spur of the moment decision so we came totally unprepared. Yet, what we found at this intriguing winter destination was far better than we had been expecting. 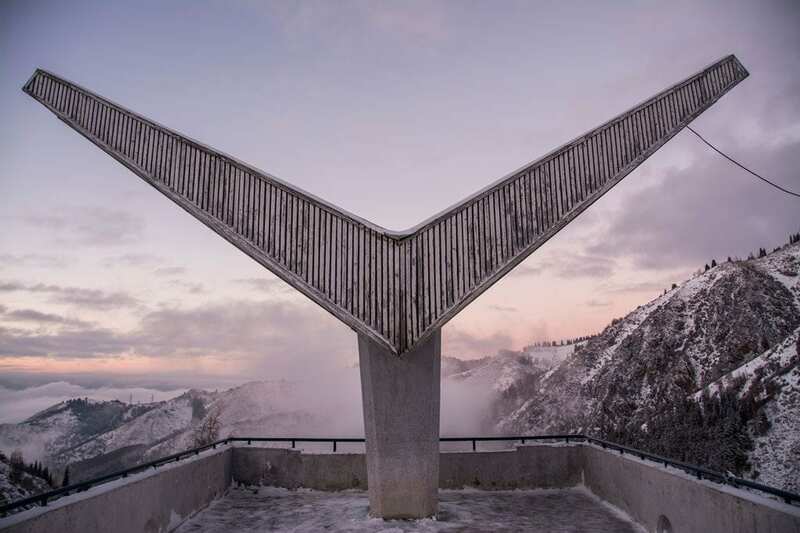 Located at 1,691 metres in a beautiful, snow-bedecked landscape of mountains and trees, more than 120 world records were set at this open-air, Soviet-era skating rink. 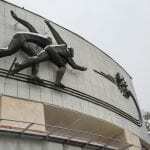 It used to be among the top ones in the world, and despite the fact that Medeu has lost some of its former glory, you can still sense the Soviet sporting ambition and prestige. There’s 10,500 m2 of ice and, although now less than in its Soviet heyday, a spectator capacity of 8,500 people. While my wife was practicing for old age making her first steps with the help of a walking frame, I started doing rounds on my rented skates. I never thought I’d swirl on ice with a crowd of teenage couples to Russian pop music blasting out of the stadium’s speakers. When half an hour later I spotted my wife gliding by without walking frame, another record could be added to the rink. In the early seventies Medeu graduated from natural to artificial ice while preparations for the 2011 Asian Winter Games resulted in a major upgrade of its facilities – there’s now a 200m2 multimedia display turning night-time skating into Saturday Night Fever on ice. When – tired but happy – we returned our rented gear, I contemplated the luxury of living in a metropolis where you can pop out for an afternoon of al fresco ice skating in the mountains, all for the price of a couple of high-street-brand coffees. For a Belgian, this felt a bit unfair somehow, but it explains why Medeu is the most popular attraction for Almatians. Yet no matter how popular the rink is, it would be a shame to ignore the other outdoor opportunities. With Almaty located at the foot of the imposing Trans-Ili Alatau mountains, hiking trails are never far away, several of them starting from the Medeu main bus stop. One leads to Furmanov Peak (3,029m) and another one to hot springs, but with most of our energy spent on our skating heroics, we could only muster enough motivation to climb the 842 stairs to the panoramic top of the dam that protects Medeu and the valley below from mudslides. 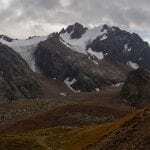 Joining other Kazakh outdoor enthusiasts on the snowy climb, it was all worth it, if not for the grilled shashlik and hot tea sold from a little food stand, then certainly for the magnificent view and bold sunset against a grey sky. It was only then that we realised the gondola which starts at Medeu continues further up, where a ski resort is tucked away behind the mountains. 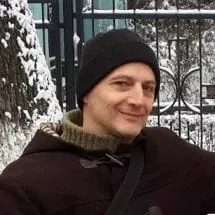 The following day – our final one in Almaty – we return to Medeu, but this time we ascend the mountain by gondola – to the ski resort of Shymbulak. As with ice skating, my wife is a first-time skier, and for me it has been two decades since I stood on the slopes. So we’re calling ourselves brave – or stupid. The gondola ride is an attraction in itself. Humming quietly above mountain ridges, tree tops and rivers, at 4.5km it’s the world’s third longest. When 20 minutes later the gondola arrives, we’re in for a surprise. This is not some tiny, rural resort but a fully-fledged complex with all the facilities you would expect at the world’s top ski destinations. 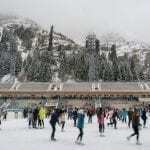 Ten years ago Shymbulak was still a former Soviet skiing curiosity, however heavy investment has now turned it into the largest ski resort in Central Asia. 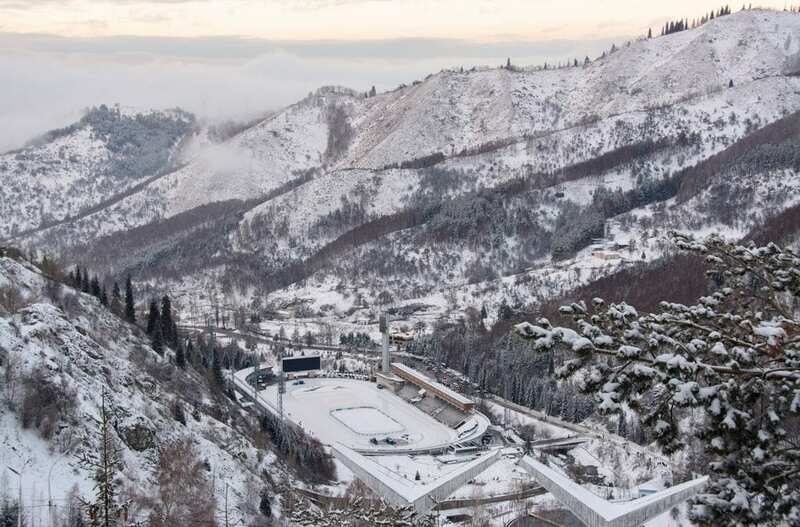 Last year Shymbulak hosted the Winter Universaide Games, which meant a substantial financial injection and infrastructure upgrade. 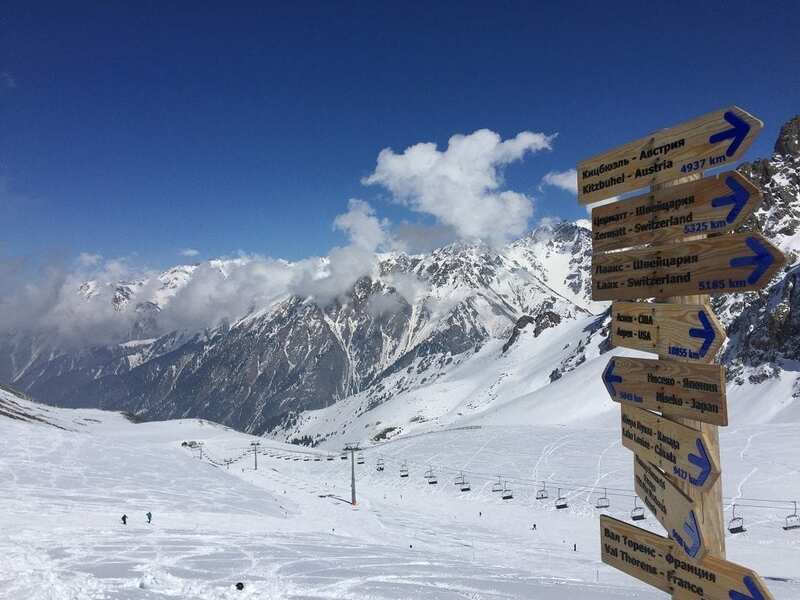 There are eight pistes covering 20 km and five ski lifts to get you up there – the highest goes to 3,200 metres above sea level – as well as snow cannons and decent choices for food and après-ski. But what makes Shymbulak stand out is that it’s as much a part of Almaty’s urban dining and cultural experience so you don’t end up spending every evening in a chalet eating cheese fondue. From the taxi and gondola-ride to renting gear and sorting out ski passes – shuttling between Almaty and Shymbulak is fast and seamless. Thinking of going to Kazakhstan, why not take in a game of Buzkashi, or headless goat polo. While I’m trying on my rented ski boots I hear someone nearby speaking English. Overhearing that he’s Thai, I cannot resist greeting him with a little wai gesture and sawasdeekap, Thai for hello. He’s as perplexed as I am. “Do many Thais come to Kazakhstan to ski?” I ask. His answer – “no” – confirms that what my teacher told me at school is plain wrong – there are stupid questions. But his – and our – presence is the exception as patrons here are overwhelmingly Kazakh or Russian. Leaving my wife in the capable hands of a handsome Kazakh instructor, I manage to hang on to a T-bar lift pulling me up the easy piste without making a complete fool of myself. The more famous ski resorts of this world may be bigger, but at Shymbulak there are no queues at the lifts while the wide slopes are blissfully half-empty. Add to that the excellent value for money – a lift pass costs less than US$30 – and Shymbulak quickly becomes a ski lover’s utopia. To my left and right, and behind me the grand mountains of the Trans-Ili Alatau range show off their forested slopes and peaks but in front of me the vista has a surreal quality – down far below lies the urban metropolis of Almaty while behind it the vast, endless Kazakh steppe, flat as a pancake, disappears into the horizon. Hours later, a chairlift is taking me higher and higher without any end in sight, and I start regretting my decision to try my luck on the piste for grown-ups. When I finally arrive at the mid-station, I hesitate. Bailing out on the sunny terrace of the cosy wooden chalet Sneg with a few beers sounds like a pleasant alternative to a broken limb. But when I gather enough courage to take the plunge, the route down is both scary and exhilarating. The one time I manage – despite the lack of crowds – to crash into a fellow skier it’s not piste-rage I encounter but a laugh and a helping hand pulling me onto my feet. Back down I spot my wife who’s actually enjoying her first skiing experience and I wonder if the instructor has anything to do with it. The man has already left though, and she’s braving that slope all on her own. In Almaty then, it seems, there’s no stopping adding on records. Medeu is a short, scenic taxi ride from Almaty centre (2,500 Tenge). Alternatively, take bus 6 or 12 (80 T) in front of the Hotel Kazakhstan, north of the intersection of Abai and Dostyk. Opening times: Tuesday to Sunday from 10:00 to 23:00 with a pause from 16:00 – to 18:00. Entrance is 1,800 T and renting skates will set you back around 1,000 T depending on the duration (bring your passport). Season runs from the end of October to March. If your Russian is up-to-date, Shymbulak’s website is quite useful. Otherwise Skiresort.info provides detailed evaluations of the pistes, lifts and more, including a trail map. Renting gear will cost around 6000 T/day for a complete set but you can also rent individual pieces. Lockers are 1000 T/day. Tip: it will still be cheaper renting your gear in town than at Medeu / Shymbulak (and then you can pretend being a local on that bus). Ask your hotel for where to find a rental shop. Season runs from December to April. If going down a mountain at high velocity is not your thing, Shymbulak is open all year round and offers also other activities such as biking, mountain climbing, paragliding and guided excursions. Lufthansa flies direct to Almaty from Frankfurt. Air Astana has flights from London, Paris and Amsterdam with one stopover in Kazakhstan. From Asia, there are direct flights from Bangkok with Air Astana. I will go this December, and your information are quite useful and written in such an exciting manner that I actually would love to go immediately)!! Trying AirBnB in the city and take the bus (renting in the city, pretending like a local). Again thanks for the info and best regards! Really glad you enjoyed the article. Have a great travel!